The Irish Post-Medieval Archaeology Group seeks to promote amongst academics and the general public a greater understanding of Ireland’s post-1550AD archaeology, history and material culture. It also seeks to promote a holistic approach to this material by means of greater co-operation with persons working in related fields of study. To undertake initiatives that will help raise the profile of post-medieval archaeology within Ireland. To foster greater contacts between those individuals engaged in researching the archaeology, history and culture of post- 1550 Ireland. To lobby for increased academic attention to be paid to the post-medieval period within Irish universities. To seek greater protection for post-1700s monuments under National Legislation in Ireland. Formed in Belfast in 1999, IPMAG’s inaugural conference was held in 2001 and has become our key annual event. Conference is held every February at locations across the country and attracts a range of delegates from professional archaeologists to the general public. We have been delighted in the past to host the conference in conjunction with the Society for Post-Medieval Archaeology (UK); and the Group for the Study of Irish Historic Settlement. As well as hosting an annual conference and fieldtrip, IPMAG has been active in lobbying government departments and heritage agencies to recognise the value and importance of our post-medieval past. This has led to increased awareness in and the study of this aspect of Irish archaeology, which has been all the more recently emphasised in this era of commemorations and where key locations are integral to our understanding of events from our most recent historical past. IPMAG has published a number of significant books on Post-Medieval Archaeology, as part of its conference proceedings series of publications. 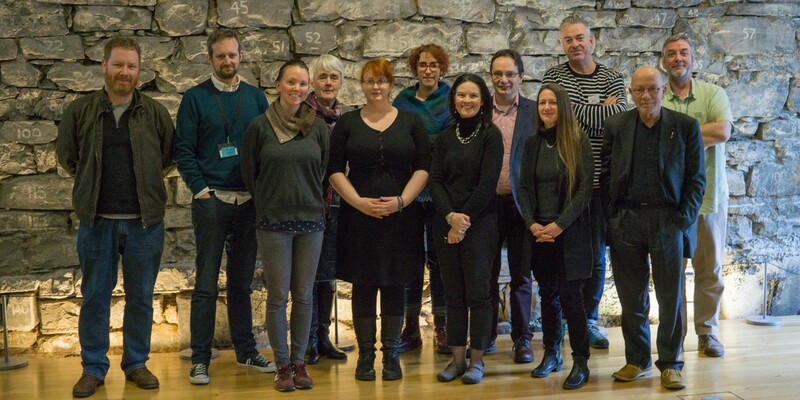 IPMAG members range from all fields and walks of life with the common goal to promote Ireland’s post-medieval archaeology both nationally and internationally. With Ireland’s rich historical archaeological landscape that represents our recent past, this cultural resource has links across the oceans to the Continent and New World where explorers, merchant venturers, emigrants, slaves and in most recent times, our Diaspora, have forged connections across the Atlantic, with many returning in time to imprint further on our national heritage. It is this post-medieval cultural heritage that IPMAG seeks to promote, protect and embrace. Dr James Lyttleton is a Senior Heritage Consultant with the engineering and environmental consultancy firm AECOM, based in their Bristol office. His main research interests are in later medieval and early modern settlement in Ireland, as well as English colonial settlement in the North Atlantic world. Following the completion of his PhD in University College Cork, he was a post-doctoral research fellow in the same institution and in Memorial University of Newfoundland. He also taught historical archaeology in both universities. His publications include The Jacobean plantations in seventeenth-century Offaly, an archaeology of a changing world (Dublin, 2013), Blarney Castle, an Irish tower house (Dublin, 2011) and An archaeology of Northern Ireland 1600-1650 (Belfast, 2017). James is currently the Chair of IPMAG. Dr Connie Kelleher graduated from UCC with a B.A. and M.A. Degree in archaeology and a PhD from Trinity College Dublin in history and archaeology. She is a full time archaeologist with the Underwater Archaeology Unit, National Monuments Service, Department of Culture, Heritage & the Gaeltacht. She has been visiting lecturer in underwater archaeology in University College Cork for the past 10 years. Connie’s research interests include 16th and 17th–century maritime history and archaeology, including shipwreck archaeology and the historical archaeology of piracy in Atlantic waters during that period. Connie is a full member of the Institute of Archaeologists of Ireland (IAI), former council member of the Royal Society of Antiquaries of Ireland (RSAI) and former board member of the international Advisory Council on Underwater Archaeology (ACUA). Connie has been a long-term member of IPMAG, serving as former chair and is current IPMAG secretary. Rosanne Meenan graduated from U.C.D with a B.A. in history and archaeology and received an M.Litt from T.C.D on the topic of deserted medieval settlement in Co. Westmeath. She has worked as a free-lance archaeologist since 1990 mainly in the north Leinster area. In addition, Rosanne specialised in the study of post-medieval pottery from excavations after having studied the assemblage from the excavations at Dublin Castle in the 1980s. Two of her most recent reports were carried out on the material from Rathfarnham Castle in Dublin and from Sherkin Island in West Cork. Rosanne has been a member of IPMAG since its foundation and has served as Treasurer and Membership Secretary for many years. Dr Wes Forsythe is a Senior Lecturer at the Centre for Maritime Archaeology, Ulster University. He currently serves on IPMAG's committee as website manager, and is also a member of the Royal Irish Academy's Committee for Archaeology. Nick Brannon studied Archaeology A-level at school. After graduating from Queen’s University he joined the Archaeological Survey, basically as a rescue archaeologist, directing over 50 excavations and publishing over 100 papers. In the 1990s he launched the Northern Ireland Monuments and Buildings Record and drafted the Historic Monuments and Archaeological Objects (NI) Order 1995 and the NI Code of Practice for the UK Treasure Act 1996. He served as Director of Built Heritage, 1999-2002. He currently resides in Virginia, USA and Co. Londonderry. Dr Eve Campbell is an archaeologist with consultancy Archaeological Management Solutions. She has a PhD in archaeology from NUIG, and has worked in the commercial, research and community sectors on projects including the Louth Field Names Project, the Archaeology of 1916, and with the Achill Archaeological Field School. Her research interests include vernacular architecture, minor place names and the archaeology of early modern Ireland. Naomi Carver is a 3rd year PhD student at Queen's University Belfast. Her research focuses on 17th - 19th century glazed coarse earthenware. Prior to commencing her post-graduate research, Naomi worked at the Centre for Archaeological Fieldwork (CAF). During almost twelve years as part of CAF Naomi participated in and directed a wide range of excavations and projects around Northern Ireland. Naomi is the Branch Leader and a founding member of Belfast Young Archaeologists' Club. Naomi joined the IPMAG committee in 2018. Dr Richard Clutterbuck graduated from UCD with a BA in archaeology and geography in 1996, and an MLitt in 1998, awarded for an archaeological study of medieval rural settlement and architecture in Tipperary. Richard subsequently worked in Ireland as a professional archaeologist, site excavation director and project manager. He returned to academic studies, completing a PhD in 2015 in the Department of NUI Galway, supervised by Prof Elizabeth FitzPatrick. His PhD presented was an archaeological study of landscape of Improvement in 17th- to 19th-century Ireland. He now works as a Project Archaeologist with Archaeological Management Solutions. Richard is a long-time committee member of IPMAG, joining in 2001. Dr Tracy Collins is a director of Aegis Archaeology Ltd. and manages a variety of projects on the company’s behalf. She holds a PhD, MA in Archaeology and a BA in Archaeology and English from University College Cork. She has worked throughout her career in Ireland in both the contract and academic sectors, having held a fixed term lectureship post in the Department of Archaeology UCC for two years. Tracy’s primary archaeological research interest is female monasticism, on which she continues to research and publish. Tracy is a full member of the Institute of Archaeologists of Ireland, being a former board and working group member, and contributing to its continuing professional development programme. She was honorary secretary on the RIA’s committee for archaeology 2009-2018. She is former chair and current committee member of IPMAG. Frank Coyne is a director of Aegis Archaeology Ltd. and takes a-hands on roll in all aspects of the company’s work. Frank holds a BA in Archaeology and History and a H. Dip in Education from NUI Galway. Frank’s archaeological research interests include upland archaeology, rock art and sacred landscapes. He publishes widely and contributes a popular monthly archaeology column in the South Kerry Advertiser. Frank is a full member of the Institute of Archaeologists of Ireland, has sat on a number of its working groups and contributed to its continuing professional development programme. He is former honorary secretary and current committee member of The Irish Post-Medieval Archaeology Group (IPMAG). Dr Gavin Hughes is Director of the Irish Conflict Archaeology Network (Trinity Centre for Medieval and Renaissance Studies), Trinity College Dublin and occasionally works with the BBC and RTE. His research interests cover the British and Irish military tradition and experience; from early inter-actions with Rome (late Republic to mid-Imperial), the inter-island campaigns of the fourteenth and seventeenth centuries, to the later international wars of Empire (1756-1948). His publications include Fighting Irish - the Irish Regiments in the First World War (Merrion: Sallins, 2015) and The Hounds of Ulster - Ulster regiments in the Great War (Peter Lang, Oxford, 2011). Elaine Lynch is a field archaeologist and post-excavation project manager at Aegis Archaeology Ltd. She holds an Mphil in Archaeology from University College Cork, an MA in History of Art and Architecture from University of Dublin, a Degree in Ceramic Design from Limerick Art College and a Diploma in Archaeology from NUI Galway. She specialises in the analysis of prehistoric pottery. Elaine's primary research area is Grooved Ware Pottery. She is a member of IPMAG and Limerick Ceramic Artists. Franc Myles is the principal of Archaeology and Built Heritage, a Dublin-based practice established in 2011. His main interests lie in the areas of urban expansion and the study of the built heritage, with a particular fascination in pre-Georgian architecture and settlement. After reading History in Trinity College Dublin, he excavated in London and Northern Ireland before spending several years in Vienna. On his return he completed a Masters degree in Urban and Building Conservation at UCD before a long period working for Margaret Gowen & Co. over which time he directed several significant post-medieval sites in the capital. He has excavated widely throughout the island and has undertaken several seasons directing sites on Inishark and Inishbofin for the University of Notre Dame. He lectures on various aspects of the interface between archaeology and architecture in TCD and continues to excavate on large development sites in Dublin. The author of several publications, his edited volume on the archaeology of the 1916 Rebellion will be published by Wordwell in 2019. Ruairí Ó Baoill is an excavation director with the Centre for Archaeological Fieldwork, Queen’s University Belfast and is President of the Ulster Archaeological Society. He is a founder member and former Chair of IPMAG and is the current IPMAG Newsletter Editor. He has directed and worked on a large number of excavations across Ireland. His research interests include Viking-age Ireland, the archaeology of Irish medieval towns, the post-medieval archaeology of Ireland and Irish folk life. Amongst his publications are books on the archaeology of Carrickfergus (2008), Belfast (2010) and Derry~Londonderry (2013). Dr Rachel Tracey holds a PhD in historical archaeology from Queen's University Belfast (AHRC Collaborative Doctoral Award with the National Museums of Northern Ireland). Her research focuses on material culture and cultural identity in early-modern Ireland and its legacy in the present, with specific interest in plantation-period archaeology and British colonial expansion in the wider Atlantic world. She additionally holds an MA in the Archaeology of Buildings from the University of York and an MSc in Dating and Chronology from Queen’s University Belfast. She is currently based at the School of Natural and Built Environment at Queen's University Belfast, working in contested heritage/commemoration in divided societies, public engagement and the digital humanities. Prof. Audrey Horning is Professor of Anthropology at the College of William and Mary and Professor of Archaeology at Queen’s University Belfast where she is also a Senior Fellow in the Senator George J Mitchell Institute for Global Peace, Security and Justice. She is a founding member of IPMAG. Dr Elena Turk is a graduate of the Department of Archaeology, University College Cork. Her areas of interest include all aspects of buildings archaeology and built heritage, in particular civic improvement in 19th century and the many ways in which the physical layout of complex landscapes can influence the nature of the community and society they accommodate. Elena has published a number of articles on 19th century Industrial workers’ housing in Ireland. She was also the primary author on two books for Cork County Council- Heritage Bridges of County Cork (2013) and Heritage Houses of County Cork (2014) and is currently working on a volume discussing Cork and European connections for the same series.